Time for mom to head home. We cruised back to Ucluelet and I dropped her off. 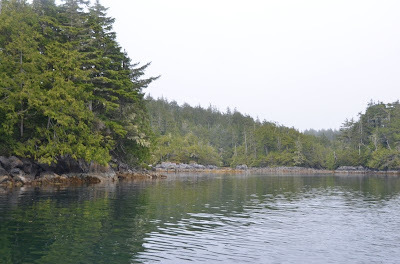 Then I headed out for Turtle Island. I’d visited Turtle Island once before, but the anchorage was full. This time I had it all to myself, which was good, since it’s a one, maybe two boat spot. I explored a bit by kayak. It’s a really neat anchorage, almost exposed to the ocean swells. From inside, the swells crashing ashore were audible. By late afternoon fog started to roll in. By evening I was surrounded. 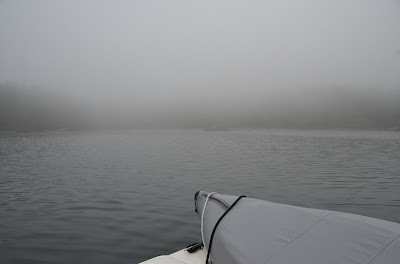 I thought about exploring more by kayak, but was worried that I could quickly become disoriented and lost if a really heavy fog rolled in and obscured the view of Retriever. A relatively minor boat problem has cropped up, one that seems to happen periodically and then fix itself. The S1000 autopilot has developed a mind of its own. It kind of holds a course, but often veers to starboard when engaging. I’ve tried holding a course for several minutes before engaging the autopilot, but the result is the same. When navigating to a waypoint, cross track errors (the distance the boat is from the intended course) rise to 150-200 feet in one direction, then 150-200 feet in the other. Very sloppy. The hydraulic steering system is full and steering is normal when using the wheel. I’ve tried messing with the settings, a factory reset, and autolearn (always fails…error code 6) to no avail. Sometimes it works great, other times it doesn’t. Weird.